HomeTwo Tips For Today: Copy and Courtesy-Making Blogging Easy. 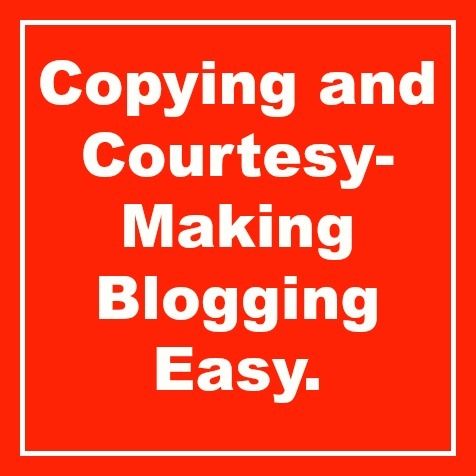 Two Tips For Today: Copy and Courtesy-Making Blogging Easy. A Blogging Tip today? I know, it’s an unusual day for one but with a recent hashtag thing I started I’ve been visiting more blogs lately and have noticed a few things, okay, two things. I’ve discussed one before; Add your website/blog site to your Gravatar.com site . . . PLEASE! This one may seem a bit odd if to you if I am actually reaching another bloggers site and reading their posts/articles. However, if I read a great and intelligent comment by a blogger and want to try and follow them, I click their name or image and I end up at Gravatar.com. That’s normal. But once there all I see is a picture. Sometimes an email address is there. That doesn’t help to get someone to follow you unless you are wanting a pen pal. You should be putting links to your blog, twitter, facebook, and/or any other link you want people to connect to you with. I’ve missed the chance to follow dozens of bloggers since I began this site for the simple reason of their being no way to find their site. Below is the gist of the post I wrote back in August and was one of my most popular post for a long time. You can even add your facebook and Twitter or whatever, but PLEASE add your blog site. Addition to article-There has been mention of About.me in the comments, which I have replied to. Gravatar.com is a site that allows one to link to sites such as WordPress and you can follow blogs and the like and comment as yourself rather than as a guest. About.me is a larger animal. Although Gravatar can do some of the same things it is nowhere near what About.me is. For details on About.me you can visit an article I wrote about it on my LitWorldInterviews.WordPress.com site. There is something that will annoy some visitors to your blog. Too many clicks to get to the reason they showed up. Or some even set it up so only part of their article appears and then you must click read more, or click to continue to get the rest of the article. I’ve seen a guy have three of these for an article. Each time the page reloaded, the ad banner reloaded. You can probably see what he was doing. I quickly left and never went back. Here in WordPress, we have something that makes an old post renewed a little more courteous. But why will some not use this or refuse to do so? Some like to have that ‘Like’ count go up on the original article. I get that, but I’ve gotten past that part of blogging. I basically want my articles read. Some like the views to go up by having the visitor click twice. Scroll down and you will find under the Writing Helper section something called Copy a Post. If you don’t see it, look to the right of the same line Writing Helper is on and you will see a little arrow. Click that and it brings down and reveals Copy a Post and Request Feedback. Click on Copy a Post. Type in the name of the article you want to copy. Click it, now it’s copied. Even the Tags copy with it and the Category. You will need to click Add for the Tags to actually take or appear in the box you are accustomed to seeing them in, and you will need to put in a new Featured Image. You want to share the post again without making people clicking a lot to get to it. It’s called courtesy. You want to update an article with new data or other information. If you do this, I would go to the old article and put in a link at the top that says there is more recent data and give the new link. Why not just delete the old article? That’s up to you. You have something that you do each week. Instead of retyping all of it every week, simply copy it and change what you need to. You can change the name of the article. I just wanted to say that and not assume people would know it. Note at the top of the article that it is a republished copy of an old article for your long time visitors to know. If I am copying for the sake of updating information, if it is information that is important that it be current, I update it in the old article as well. People link to some of my articles at times and I want to be sure anything they are sending people to me for is as accurate as possible. Those are the Two Tips for Today. Hope you find them helpful. ← 18 Quotes to Inspire Writers, Bloggers–Everyone. Good advice! I’ll check mine tonight, but I think my site is on there! Guilty as charged – as I think you know! I searched generally to do just that, came upon a lot of redundant guff so did what you rightly point out is a pain. And then you show me the way. Doh! Pretty please forgive my inadequacies! We all start from somewhere, right? I started blogging about 11 years ago, but so very much has changed since then. I’ve been playing catch-up at least since I got to WordPress. Gravatar is good. I started looking at Gravatar as a “hey guys, here’s where all to find me.” In fact, I realized there were a few details I needed to add, so, I just did some tweaking as of this moment. Speaking of that– what’s your thoughts on about.me? I read your other post about Gravatar, and read in the comments you’re using it, but not quite so much why or how much (or lack of how much). I have used the Copy a Post feature, but I haven’t linked back to original articles- don’t see the need quite at this time. You’ve seen already that I write nigh to a dissertation sometimes, and maybe you’ve noticed a few of my posts aren’t exactly light reading. 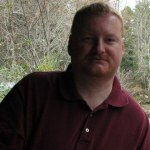 I used About.me as something of a central hub for all of my various sites, much like Gravatar, but the great thing with About.me is you can have your post titles show there with links automatically so if anyone is using it as a way of keeping track of you they can see and click new articles. They are making additions to the site more and more recently. And it is a great way to find like minded or like interested people around the world to connect with. I’ve been found that way and followed and I have followed others that way. Ah, okay. I had been guessing that part of the appeal had been that about.me was less specifically tied to WordPress. But if it’s got some great new advantages like that, I’ll check it out a little more. Thanks. I actually rewrote an old post last week and published it as a brand new post, only because I wanted new followers to read it. In fact the original only had two likes and one comment and I loved the article so much I rewrote it. However, I had no idea about the “copy a post” feature. It’s been staring me in the face all this time and I just chose to overlook it for whatever reason. Now I know what it does, I’ll be using it often. Thanks, Ronovan. Helpful as always. Great advice. I think my gravatar info is up to date, but I’m going to double check. Thanks! Good advice… I occasionally republish older posts, usually updated from early ones that were barely seen. I’ve always just copied and pasted… ‘copy post’ sounds easier! As to the Gravatar, yep. I agree.. and shall now scurry off to add the bits I thought were there, and on G+ too, but which, apparently, I haven’t updated since I set up a few things. Thanks for sharing these tools. Both will make my blog better. Gonna fix mine today. Thank you for this information! I am guilty of sending people over to the other site… I do mostly reblogs and petitions. I never had any intention of having a blog, but because there were so many blogs I read and petitions that I sign…that I wanted to get them out there.I have been try to teach myself, I used to be able to post YouTube videos and now all I get is their address… I don’t know what I’m doing wrong and WP keeps changing things and its getting me very frustrated! I have been thinking of of quitting but because surprisingly I’m up to 322 followers and I feel the petitions are important to get out…. so this information came at the right time for me, I guess that means it’s a sign that I should keep going. Post the share link from youtube into the Text and not the Visual tab of the post editor. If you do Text the video will show up as a video. If you do it in Visual then you see the link and no video. Hope that helps. Making a blog post be “sticky” can be helpful, too. You’re right about the inconsistencies with different themes. It’s been hard to find different styles that work, to provide some variety in the blog sites I have under development. The powers that be need to be correcting those problems, instead of fixin’ stuff that ain’t broke. This is a link to an article I wrote on about.me on my LitWorldInterviews site. It gives the site in some detail and some information you might find useful. Thank you, I’m going to take a look at it now! Appreciate all the tips. Have a great day. Great post and reminders! I added my websites to my gravatar–I’ve had the same problem trying to find out about someone and gave up. The Copy a post info is very timely. Will be using that one soon! thanks, Ronovan! Oh, Ok. I’ll take time to update the gravatar page. Bingo! Wait, I thought I was at girls night out. I meant EXACTLY! Yes, little old ladies love me. I have no idea why.